The director of Radio Biafra, Nnamdi Kanu, real name Nwannekaenyi Kenny Okwu-Kanu has been on the run from Imo state police after being caught in an arms purchase sting with some of his gun suppliers according to a Police press release in the Sun newspaper from March this year, posted below. 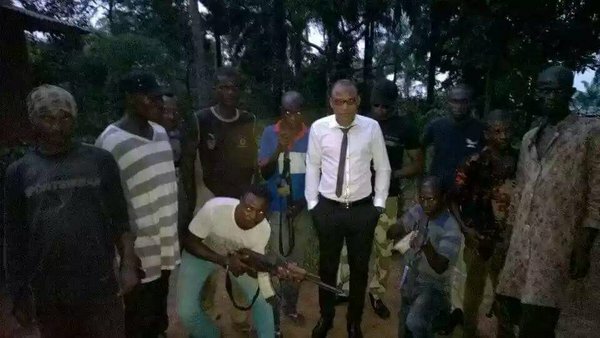 Nnamdi Kanu had just purchased five Ak47s from some arms traders who double as Pastors in March of this year. As the “Pastors” came back to supply him a second batch of five guns, the police was on their trail and arrested them. 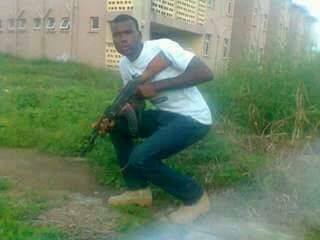 Nnamdi Kanu escaped and has since been on the run from the state police. Nwannekaenyi Okwu-Kanu (his real name) was arrested in Lagos, Nigeria on the 14th of October this year. It is not known what he was doing in Lagos. Is Kanu Released And Hiding? He was initially charged for organizing an illegal group and inciting violence among other criminal charges. He was allegedly granted bail and said to have been freed, but reports have it that he was moved due to his threat to national security, being involved in capital offenses including grand treason, terror and sedition. Detectives attached to the Mon­itoring Unit of the Imo State police command have arrest­ed two General Overseers (GO) for alleged gunrunning. The sus­pects, Clifford Nmenabu, founder, God Covenant of Christ the King Sabbath Missionary and Festus Daniel Igwe of Zion House of Prayer Sabbath Mission­ary were alleged to have procured five AK47 rifles for use during the forthcom­ing general elections. CP Ali explained that in the course of in­vestigation, it was discovered that the cler­ics were contracted by one Mr K. Nnamdi who they claim is based in London. 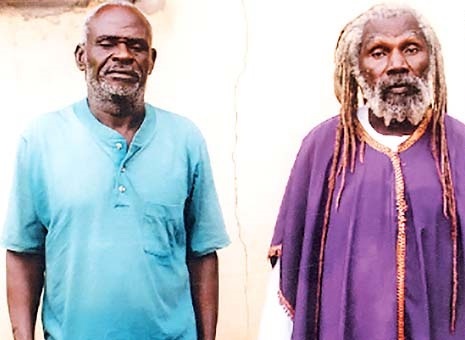 “The two clerics were given an advance cash of N300,000 for 10 pieces of AK 47 rifles and to be given a cash balance of N1.2million as soon as they deliver. The police boss also said that his com­mand has declared Nnamdi wanted and would charge the suspects to court at the end of the investigation. One of the suspects, Pastor Nmenabu, 67, said that apart from his ministry, he is dealing in arms. “I am the General Overse­er of God Covenant of Christ the King Sab­bath Missionary. I have been in the minis­try for over 35 years. I am also into buying and selling of arms and ammunition. I was listening to Radio Biafra London when the broadcaster, who introduced himself as Nnamdi, gave out a number through which he can be reached. 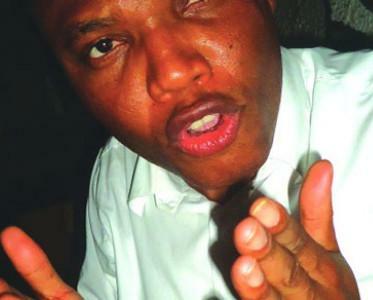 I called him and he ex­plained that he is the coordinator of the popular Biafra group. “I told him who I am and what I can do for the group. He gave me the contract and I decided to ask my fellow priest, Igwe who has contacts. 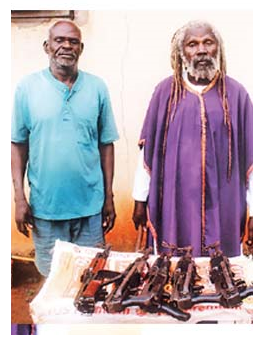 He offered to pay N1.2 mil­lion for 10 AK47 rifles. He gave us N300, 000 as a deposit. We were waiting for the balance when policemen stormed my house and arrested us”, he confessed.The second suspect, High Priest Festus Igwe, 63, said that he is willing to assist the police to track down Nnamdi who is currently on the run. “I am the GO of the Zion House of Prayers Sabbath Mission. I was in the church, when Pastor Nmenabu contacted me that there is a good business on ground. I rushed to his church and gave me the details. Luckily, I still had contact with some arms dealers in Imo state. He also introduced me to Nnamdi who gave us an advance fee of N300,000. “We had delivered the five AK47 rifles and was waiting for Nnamdi to bring the balance when the police arrived. I am very sorry. I am ready to assist the police to track down Nnamdi”, he stated.